Enjoy this day trip from Tokyo to Kamikochi, one of the premier mountain resorts in Japan located in Nagano prefecture. Spend around 4 hours at Kamikochi exploring the stunning mountainous landscapes, which is designated as a Special Place of Scenic Beauty of Japan and a Special Natural Monument of Japan. Highlights of the area include crossing the symbolic Kappa Bridge (a wooden suspension bridge), the views of the Hotaka Mountains, Mt. Yake, the transparent water of the River Azusa and willow trees. Meet with your tour conductor and start your journey with the 5-hour long but comfortable bus ride with breaks to Kamikochi in Nagano Prefecture. After arriving at Kamikochi, you will have approximately 4 hours to explore this breathtaking area. Kamikochi is located in Azusa River Valley, part of Chubu Sangaku National Park and surrounded by mountains. Since this is an area of outstanding beauty and therefore for preservation concerns, visitors can only access from April until November. Although there is no particular way or route to explore Kamikochi, following the trails along the Azusa River is popular as it grants visitors with spectacular views of the river, mountains and lush greenery simultaneously. 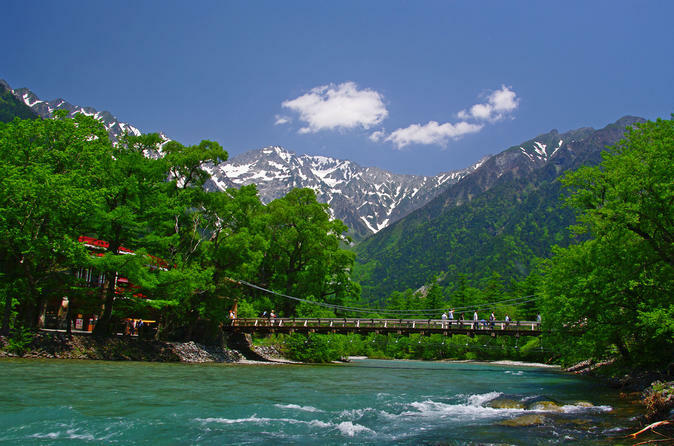 After a wonderful walk from the Kamikochi coach terminal, you will reach Kappa Bridge, the symbol of Kamikochi, located at the heart of the resort. From Kappa Bridge, you can follow the Azusa River and visit various stunning spots such as Takezawa Marsh, Myojin Pond, Taisho Pond and Tashiro Bridge. Visiting Kamikochi anytime during the opening season is a pleasant experience. From April until September, you will be able enjoy the beauty of the alpine flora. From October to November, you will be able to see the mountains covered by colorful autumn leaves before the area is closed to the public for winter. A boxed lunch option is available for this tour. Prepared by Gosenjaku Hotel, you can savor it while sightseeing or walking in Kamikochi. If you would like to order it, please choose the "Lunch" option at the time of booking. Those who do not wish to order the boxed lunch are advised to bring their own food or buy it before arriving in Kamikochi, for example at service stations on the expressway etc., as restaurants in Kamikochi are extremely busy during the season. At the end of the day, ride a bus back to Shinjuku. The approximate arrival time is 20:40.